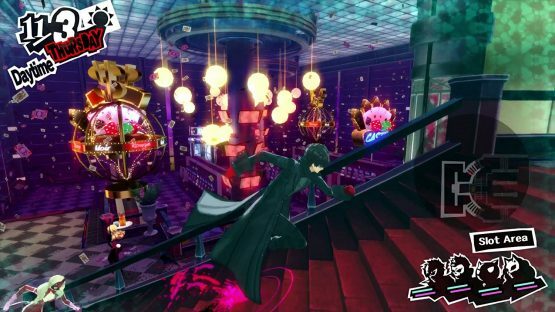 Things go bad rather quickly in Persona 5, as an exciting tutorial ends with the player getting caught during an attempted casino heist. 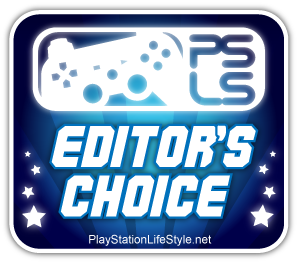 This action packed start is a huge upgrade from 2008’s Persona 4, which had the player pressing the cross button for about 20 minutes before they could even take control of the character. It’s a sign of the many lessons that Atlus has learned in the past nine years, and the narrative soon unfolds under the framing of a police interrogation. This opening also serves to set the dark tone of the game. 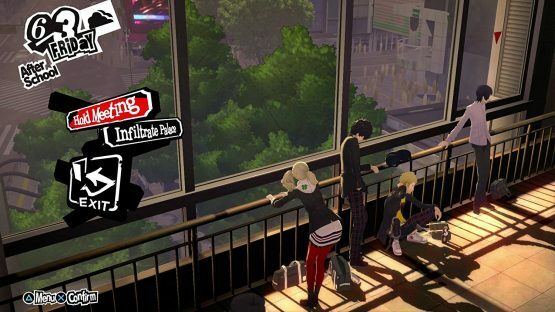 While past games in the series haven’t exactly been the cheeriest affairs, Persona 5 regularly deals with tricky topics such as sexual abuse and racism within Japan. Almost every character in the game is shown fighting personal demons that have them branded an outcast by society. Even the game’s nameless protagonist (Bo Jangles, in my case) has baggage, as he had recently been expelled from school after falsely being accused and convicted of assault. This leads to Bo being forced to move in with a family friend that promptly has the 16-year-old live in the attic of the café he operates, this cold relationship is in staunch contrast to living with the likable Dojima and Nanako in Persona 4. Since Bo has the label of criminal cast upon him, it makes his new start a messy run, as rumors run amok about him at his new school, and the only friend he can initially make is a troublemaker named Ryuji. As mentioned previously, the stars of Persona 5 are thieves. What separates the high school students from common criminals is that they aren’t stealing jewelry or money, but rather the hearts of mean-spirited individuals. This is where the series’ signature dungeons come into play, as the Phantom Thieves are gifted with the ability to enter an alternate realm called the Metaverse, where they can destroy the distortion in a person’s cognition, and essentially make the scum of the Earth have a change of heart. This thief motif bleeds into the actual gameplay as well, as dungeons are no longer just a connected assortment of floors, but rather guarded buildings called Palaces that’ll force players to solve puzzles and use inventive use of the geometry in order to get around blocked passageways. This is easily the area where the Persona formula has been improved the most, as sneaking around the dungeons is a true highlight. A layer of stealth is also introduced, as players will have to hide in cover in order to sneak up on enemies. This’ll give them an important edge in the game’s turn-based battles, which will feel very familiar to fans of the series. Battles still consist of taking advantage of elemental-based weaknesses in order to earn additional turns, and using a balanced team of four to defeat various demons. A few new elements have been added, such as being able to use a limited-use gun, and characters will sometimes get taken hostage (where players will be forced to negotiate by paying demons to let them go safely), but it’s mostly more of the same Shin Megami Tensei battle system that players have grown to love. When I wasn’t stealing hearts in the Metaverse, I was attempting to do the same in the real world. My favorite part of the Persona series has always been the life simulation aspect, where players get to role-play as a Japanese high school student. There’s a ton to do here, as I ended up getting a bit too much into the batting cages, visited a maid café in the red light district, and got to explore Japan at my own pace. 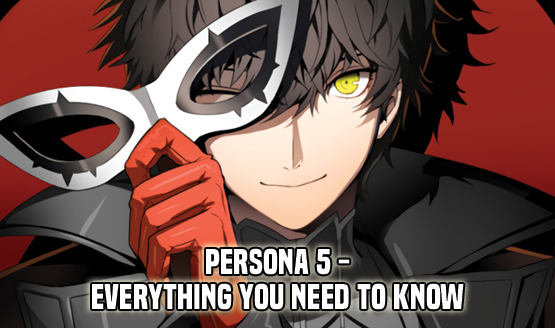 The sense of exploration is one of the major differences compared to past titles, specifically Persona 4 since it took place in a small town, as players can travel to multiple areas via train, and it seemed like I was always finding something new to do in my 60+ hours with the game. From competing in burger eating contests to taking a friend shopping in Akihabara, I was consistently discovering new things to do. There are some downsides to how large the area is, as it was easy to forget where certain characters hang out (even after finishing the game, I still have trouble figuring out where my teammate Yusuke was), and the fast travel system doesn’t communicate where players are all that well. Oh, and you can eventually start dating some of the great female characters in the game. This is something I was a bit too good at, as I ended the game while being in four separate relationships (this made Valentine’s Day a hilarious experience). I even accidentally started dating a teacher from school, since I was sure I could flirt with the adult without any consequence, but that wasn’t the case as the game totally allowed the adult to take advantage of the young Bo Jangles. Nothing more explicit than a “special massage” goes down on-screen, but it didn’t really jive with the game’s other themes as the first story mission revolves around stopping a teacher who is preying on students. One of the most captivating aspects of Persona 5 is the staggering amount of style it displays. Everything from the menu presentation to the scene transitions are covered with personality. It may not be a technical showcase like Horizon Zero Dawn, but there’s zero doubt in my mind that this’ll age considerably better than its contemporaries. Throw in an incredible jazz soundtrack (that really adds to the heist scenes), and Atlus has easily created one of the most stylish games ever made. Predictably, another strong suit comes in the form of the story. A lot of the tension comes from the opening scene that shows the protagonist getting sold out by a member of their group, and thus every character introduction is met with some suspicion. Despite this, I couldn’t help but be charmed by the majority of the characters. Strong writing has been a staple of the series, and it really shines here. Voice acting is also a highlight, as some strong performances really help bring the characters to life. Sadly, a ton of scenes in the games (including some very pivotal ones) aren’t voiced, which leads to the one disappointing aspect of the localization. This may have been acceptable when Persona 4 released in 2008, but standards have changed in the past nine years, and it’s seriously disappointing to have so much unvoiced dialogue. Characters are really what makes the Persona series special, and the cast here lives up to the heavy shoes of its predecessors. From the mysterious cat Morgana (who can somehow turn into a bus) to the student council president Makoto (the undisputed best girl), I found myself enjoying every point of character development. The only baffling thing is that in a game filled with amazing characters, the protagonist is relatively lifeless. The vast majority of his dialogue isn’t voiced (despite the character having a voice actor in cutscenes), and his personality rarely is shown. I’m not against blank slate protagonists, but considering the limited amount of influence the player has in choices (you can’t date men or influence the story greatly), it’s disappointing to see the protagonist being so bland. Another disappointment comes near the finale, as things start to become a slog just as the story is starting to peak. This is due to the game inexplicably forcing players to go through a 60+ floor dungeon that has been randomly generated. This goes against the fantastically designed Palaces that make up the bulk of the game, and it only serves to artificially lengthen a game that otherwise very much values the player’s time. Thankfully things pick up afterwards, and lead to a really memorable ending sequence, but the one down period in the game could’ve been easily cut without anything being lost. Persona 5 is proof that few titles can compare to a truly great role-playing game. Over its 60 hour playtime I got to forge meaningful friendships with an eccentric cast of characters, discover the secrets of Tokyo, and even managed to find some nice restaurants to dine at. The time investment might seem like a lot, but rarely is time wasted when spent with friends. It doesn’t reinvent the genre, as it largely builds upon Persona 4‘s stellar base, but it adds a level of polish that is simply lacking from its contemporaries. Review code for Persona 5 provided by publisher. Reviewed on PS4 Pro. For more information on scoring, please read our Review Policy here.